Sometimes it is fun to just explore for fossils or minerals by visiting an unknown location, perhaps one with potentially appropriate geology, but not a site with documented fossils or minerals. One may not find much, but occasionally one stumbles onto something completely unexpected and equally interesting. 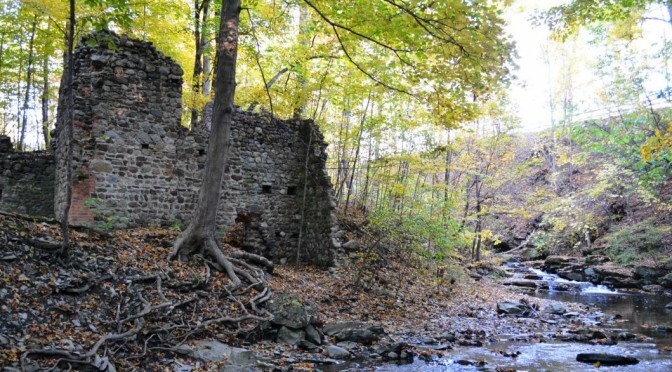 In the fall of 2015 Stephen Mayer and I had such an experience when we decided to investigate the geology along Reeder Creek in Varick, NY. I have trouble finding one lone whole trilobite when I go out collecting in the Devonian of New York. 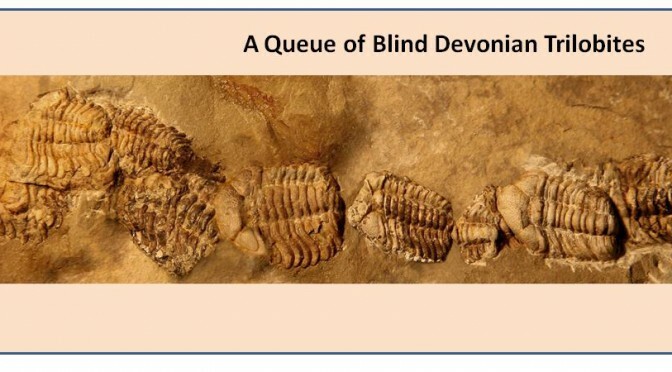 And then along comes this note from central Poland where researcher Blazej Blazejowski reports that the eyeless trilobite Trimerocephalus chopini can be found preserved in trains with head to tail (or in trilobite lingo with cephalon to pygidium). He infers that the queues actually represent migratory chains as the ancient arthropods marched across the seafloor, perhaps in an unsuccessful effort to escape near and present danger. Wouldn’t it be neat to find a queue of arthropods after splitting some Hamilton Group shales? Or maybe there was no reason for New York trilobites to migrate? Perhaps life was just too good to move? Blazejowski, B., et. al., 2016 Ancient animal migration: a case study of eyeless dimorphic Devonian trilobites from Poland, Palaeontology, V. 59, p. 743-751. I have written about Green’s Landing east of Canandaigua Lake after each of my summer visits the past 4 years. This time I will keep the words to a minimum and illustrate a wonderful joint trip with mostly pictures. Many thanks to Stephen Mayer for writing this collecting trip note for the August WCGMC newsletter and also for allowing me to post it my blog. Tammy and I are back from a vacation in the desert southwest. Naturally, we took some time between visits to National Parks to do a little fossil and mineral collecting in Utah. The setting and geology are quite different than in western New York. Very thick shale and calcareous mudstones are widespread in Millard County, west-central Utah and contain some of the best Cambrian biotas in the world. Not only are there 505-520 million year old fossils abundant, but also recent volcanism in the same region has left its mark with abundant rocks and minerals. 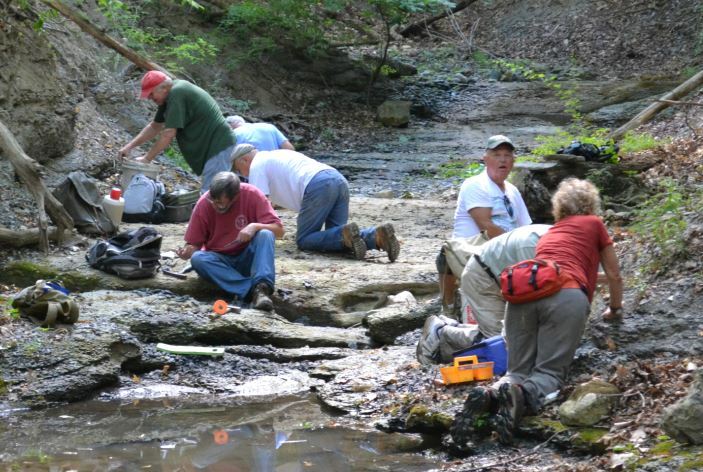 Specifically, well preserved trilobites and beautiful topaz crystals can be collected. Having been rained and flooded out in June, the WCGMC found a way to squeeze a trip Alden into its August schedule visiting the ever popular site on Saturday August 29th. This time the weather was perfect, the water was low, and, as always the fossils were there to be collected. 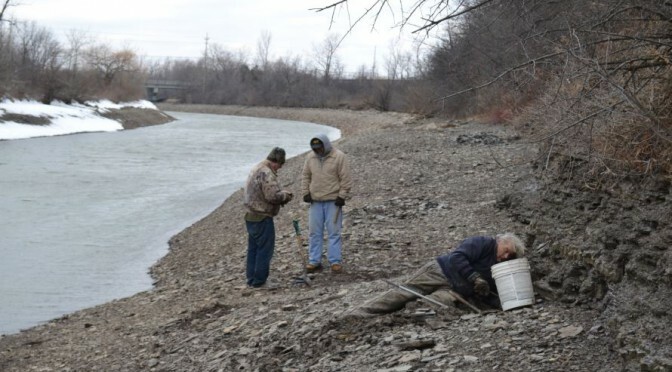 The formidable Ledyard shale cliffs in the creek bed have been a favorite site for collectors for several decades, but winter erosion always seems to expose new ones to extract with a little digging. Stephen Mayer is a member of the Wayne County Gem and Mineral Club and wrote this piece for the March 2015 newsletter. It is certainly an informative and appropriate entry for my blog and with Stephen’s permission I have included it. Whether collected by oneself in a creek bed, road cut or quarry or just simply observed in a museum’s exhibit, trilobites have fascinated people for thousands of years. Excavation of early burial grounds 50,000 years old have revealed trilobites with human remains (AMNH, 2015). Their fossil forms have been the basis of numerous studies by everyone from paleontologists to school children. Trilobites are extinct arthropods distantly related to the modern marine lobsters and horseshoe crabs. In the Burgess Shale in the rugged high peaks of the mountains of British Columbia, Canada an amazing group of soft-bodied organisms have been found including Trilobitamorpha – fossils that appear to be like trilobites but just have not fully evolved yet. Then true trilobites first appeared during the Cambrian Period about 521 million years ago during the “Cambrian Explosion” as a result of the development of a chitinous exoskeleton which permitted fossilization of these organisms. My fledging knowledge of fossils grew this month when University of Rochester Fossil Technician Gerry Kloc introduced me to Eldredgeops and his book on Trilobites of New York. For over 150 years the common Devonian trilobite of New York and other North American locations had been referred to as Phacops rana, after the description and identification of Phacops latifrons in Europe. The literature, museums, and individual collections carry the name. As it turns out, this North American trilobite is not a Phacops genus, but rather an Eldredgeops. Although this has been known in the paleontology world for two decades, many specimens continue to be misnamed. A most thorough and readable note on the distinction between the two genus can be found on the Fossil Forum website (www.fossilforum.com). The discussion, dated June 8, 2014, is called Phacops Vs Eldredgeops and is found in the General Discussion Forum of the website. 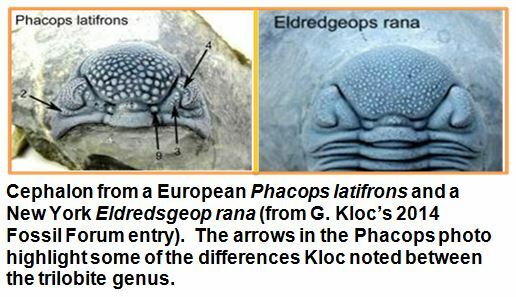 The author is Gerry Kloc, a Rochester paleontologist who has studied trilobites extensively. Gerry has identified numerous subtle, but definitive, differences in the cephalons between the European Phacops rana and the so called North American variety. He concludes that the Middle Devonian New York species is actually an Eldredgeops and proposes it be given the full name Eldredgeops rana. If you have one, it is time to update your label. The Rochester shale comprises the upper 85’-90’ of the Middle Silurian Clinton Group in upstate New York and southern Ontario. The upper two-thirds of the unit contain numerous grey limestone beds, which can be sufficiently resistant to form outcrops, but which are poor in fossil content. 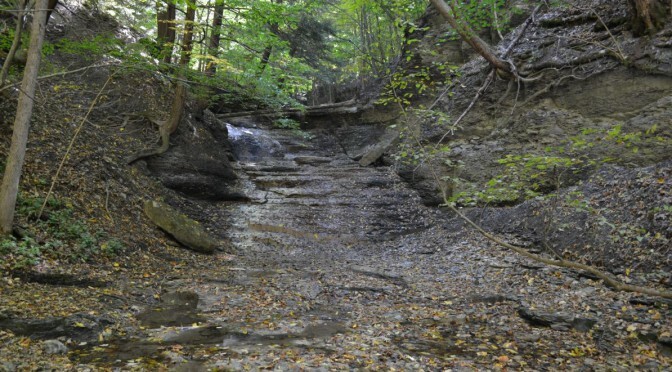 The lower 20’ of the Rochester shale is notoriously susceptible to erosion such that outcrop exposure is rare. Unfortunately, it is this rapidly weathering unit at the base that contains the abundant fossil assemblage (specifically trilobites) for which the formation is famous. The best visible exposure of the full Rochester shale section is in the gorge walls of High Falls on the Genesee River. However, this section is agonizingly unapproachable for fossil collection, particularly so the lower 10-20’ of section best known for fossil diversity and abundance. 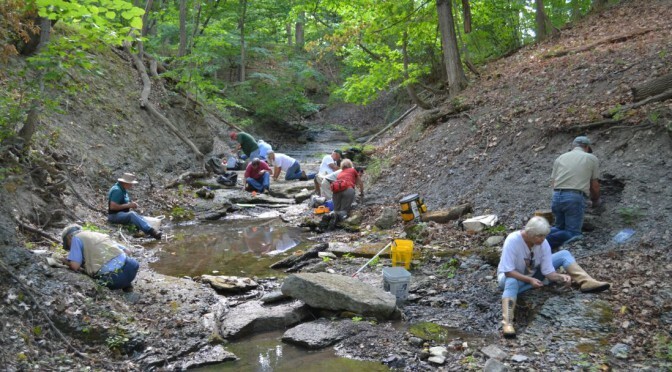 Over 200 invertebrate fossil species have been identified from the Rochester shale including corals, brachiopods, bivalves, gastropods, cephalopods and crinoids. 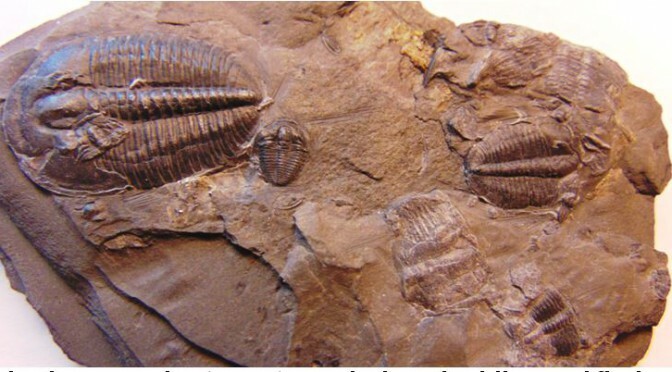 But, it is the spectacularly preserved trilobites that have attracted collectors to the Rochester shale since James Hall first detailed their occurrence in the 1840’s. The diverse fauna combined with the fine grained shale beds and thin limestone units indicate that the Rochester shale was deposited in warm, well oxygenated marine waters of intermediate depth. But where does one find outcrop to search for fossils?